LG Tone Studio: are “personal wearable speakers” the next thing? 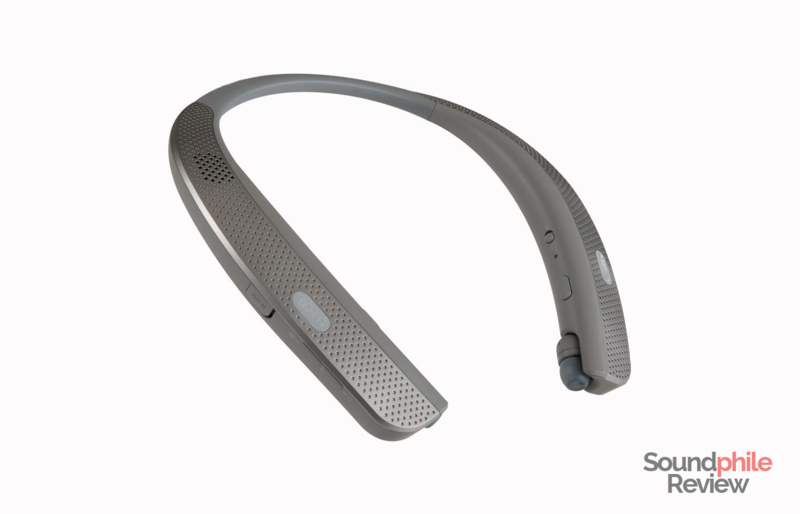 The new device by LG features a neckband design similar to that of the Skullcandy Method Wireless, and it embeds four speakers: two full-range on top and two vibrating on the bottom. Looking at the picture provided by the firm’s PR agency, it seems like there are earphones there, too. It is indeed an interesting concept, as it enables the listener to experience the freedom and sound made possible by speakers, but on a much more personal and intimate way. The LG Tune Studio is obviously made for indoor use, but opens up new scenarios. The company claims it designed it “in collaboration with surround sound experts at DTS to bring a realistic theater-like sound for a cinematic experience wherever you may be”, but it remains to be seen how the device will behave in real-world tests. Will the LG Tone Studio be just a novelty or will it be the first in a new kind of consumer devices? Will it keep on its promise to bring better surround sound to users without the hassles of headphones (e.g. comfort)? The device will be on show at CES in less than a week. There is currently no word on when the LG Tone Studio will be launched and what markets will be involved.